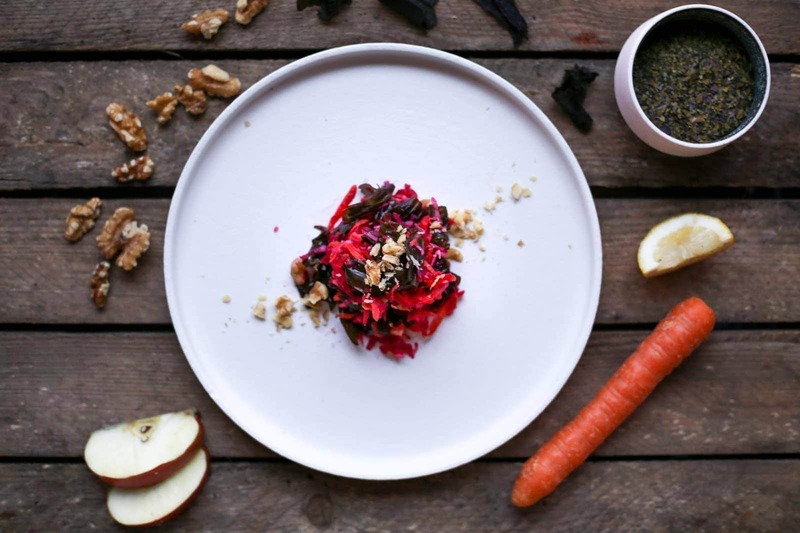 Winged Kelp, beetroot, carrot and apple salad - Lofoten Seaweed | From Lofoten, Weed Love. 1. Grate carrot, apple and beetroot into long strips. Chop walnuts into small varying sizes. Place in a medium to large salad bowl and mix well. 2. Place a pot of water on the stove at high heat. When the pot boils, place the winged kelp in the water and cook for 2-3 minutes. Remove the winged kelp from the water and pat dry. Slice the re-hydrated winged kelp into long strips. 3. Add the winged kelp into the bowl and mix well. 4. Add lemon and a pinch of salt as you like. Add balsamic to taste.